Who’s in charge of your terms and conditions? The answer, in most businesses, is the legal team. You design a product or service, and then a clever lawyer draws up some Ts&Cs to make sure the business is protected. But they’re the wrong people. If you don’t believe me, ask Daniel Ek, Spotify’s chief executive. He just had to issue an apology for changing their Ts&Cs, making a mess of them and getting a hammering on Twitter. Because these days, when customers expect transparency from the companies they deal with, a long, dense set of terms seems suspicious. And now people have the channels to make a big, fat fuss about it. So it’s time to give responsibility for your Ts&Cs to someone else. Your terms are one of the first examples your customers have of what it’s like to deal with your business. They’re an important touchpoint, to use the jargon. They set the tone for the relationship you want to have with your customers. They’re reputationally important. And businesses that are normally brilliant at customer experience often let themselves down when it comes to the ‘legals’. Apple Music’s terms and conditions were 20,000 words long. 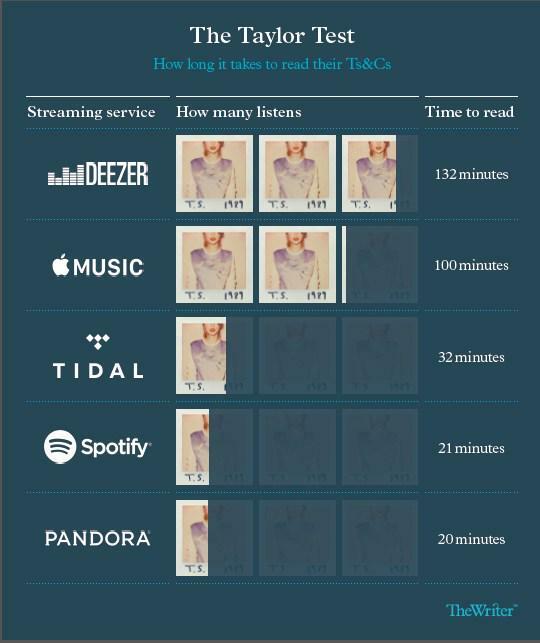 They’d take you two hours to read (or more than two listens to Taylor Swift’s latest album, if you’re measuring using our Taylor Test). Not only do they take ages to get through, they’re also hard work; too hard. They score low on the Flesch-Kincaid readability test – about the same level as the Harvard Law Review, incidentally. That’s what you get if you leave your writing to the lawyers. Of course, your legal team should have a big say. There’s stuff that a responsible business should be letting its customers know. But they shouldn’t have the last word. Because I’d argue most brands’ Ts&Cs aren’t just a pain, they’re pretty unfair. Our research says people spend five minutes on average reading through Ts&Cs (to be honest, we were surprised it was that high, and we suspect it’s lower on the internet or on smartphones). So if a business really cares about its customers as much as they all claim to, it should be getting its legal stuff across in a way that works for their customers, in the time that they’ll realistically spend reading. So here’s the standard I think businesses need to live up to: make sure your terms can be read in five minutes, by an intelligent teenager (that’s 1,000 words and a score of 60 to 70 on the Flesch-Kincaid test). If your legal team can do that, then great (many lawyers are very good writers; it’s just that number one on their priority list isn’t normally ‘make sure our customers get it’). If not, give the responsibility to someone else, with the lawyers as advisers. That could be marketing, customer service, or whoever will stick up for the customer when it really comes to the crunch. And maybe you’ll get a Twitter love-in, rather than a roasting.